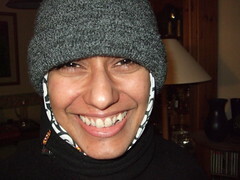 This is my picture for 31st January, 2009.... a twelfth of the year done! (actually, a little over that). I was perfectly comfortable, but Monica needed a hat, a buff and a coat. This was inside, and the central heating was on. She's not ill. She just likes it a few degrees hotter than me. You can see the whole of January in the summary collage, or go straight into February.